Scotia had hoped to reach Tristan da Cunha, but due to the strong head winds and the lack of coal she made for Cape Town. Soundings continued in these uncharted waters. On approaching South Africa the boiler developed a leak, so Scotia became a sailing ship once more. The boiler was repaired and the ship steamed past the lighthouses and the leper colony of Robben Island into Cape Town Bay. Scotia was very well received in South Africa and the scientists were taken on several excursions. 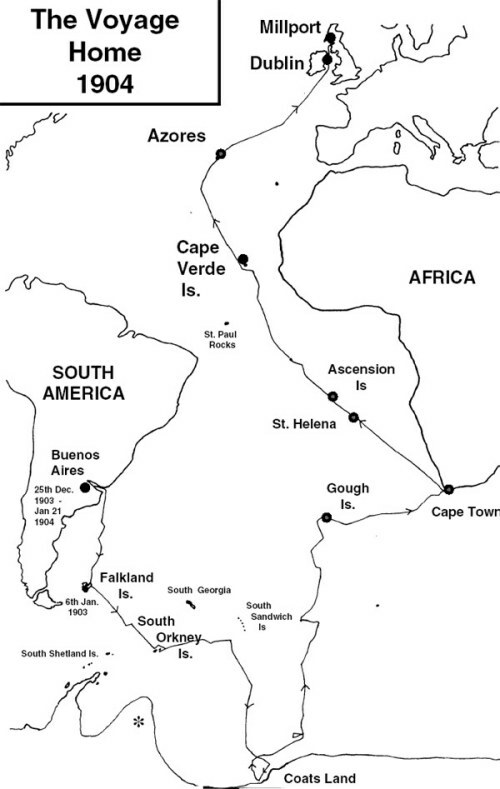 On 21 May 1904 Scotia sailed from South Africa. The dredging and the trawling were now over and she sailed north (often with the help of steam) at speeds up to nine knots. Scotia anchored at Jamestown, St Helena on 30 May. This island used to be a provisioning stop for ships sailing around the Cape of Good Hope before the Suez Canal was opened in 1856. After the Battle of Waterloo, Napoleon was exiled to St Helena where he died in 1821. His body was returned to France in 1840. The shore party decided to climb the steep slope up to the site of Napoleon's house and grave. On this occasion Bruce decided to hire a horse for the steep ascent. The rest of the party were ahead of him and hid behind a house. As Bruce approached, Kerr started up a march on the pipes to the dismay of Bruce and his horse which became very restless. 'For Heaven's sake, stop those damned pipes,' Bruce said. It was the only time anyone had heard Bruce swear during the whole Scotia voyage. Little of the natural vegetation still remained on St Helena. When discovered in 1501 it had rich vegetation and forests of ebony and red wood. There was much soil erosion by 1904. The next port of call was Georgetown on Ascension Island where Scotia arrived on 2 June. This island had a population of 200 seamen and 100 Africans. There was very little vegetation on this volcanic island. In recent years it has become an important staging post for aircraft flying from Britain to the Falkland Islands. Scotia sailed on 6 June after further investigation of the vegetation and sea life around Ascension. She crossed the equator and sighted St Jago in the Cape Verde Islands before making her next stop at Horta in Fayal in the Azores on 5 July. Scotia sailed again on 6 July, passing the Tuscar Rock lighthouse on 14 July. After a near scrape on the Arklow Bank she arrived in Kingstown (now Dun Laoghaire) near Dublin on 15 July. * on the map signifies area of land shown by Morell's map in 1823 and thought to be South Greenland. This is shown on Bruce's map but does not exist. Morell probably had found part of the Antarctic Peninsula but his navigation was suspect.